About nine or ten years ago, right about around the time I exhausted the kids' section of my community library and was beginning to discover YA, I used to read a lot of stuff on FictionPress.com. That's where I discovered a story called Queen of Glass--it was fantasy, totally epic, and so well-written compared to most of what was usually posted on that website. I read it as the author posted it, and was so sad when she took it down after it was finished. However...I was beyond excited when I found out that the author, Sarah Maas, had sold it to Bloomsbury! 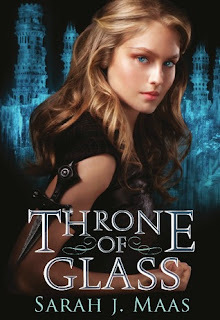 And I am so pumped for it, now entitled Throne of Glass, to come out this month! This is such a good book, and very near to my heart, and I can't wait for you to all read it. I enjoyed reading the final version (it's so hard not to blurt spoilers, let me tell you...) and I am excited to see how it will progress! So naturally it had to be this month's choice for the monthly commenter contest! How to win: Every time you post a significant comment that contributes to the conversation, I give you an entry into the contest! The more you comment, the more you entries you get! Only comments on posts from August 2012 are eligible, so keep coming back for more posts and more chances to comment. For all of the details, click here. I received the arc of this book to review. It was fantastic! Next, I'm looking forward to reading Grave Mercy. It's on my nightstand right now just waiting...! Throne of Glass was so good! I loved it.